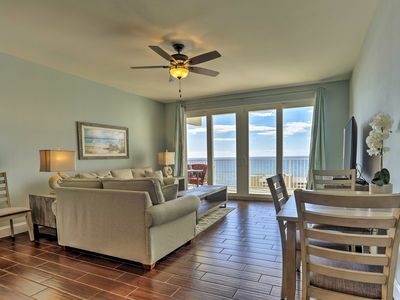 As soon as you walk in you will be taken away by the ocean views, large open floor plan and modern kitchen. This is a Freshly Remodeled HUGE 2 bedroom/2 bath condo with new paint, porcelain tile, furniture, appliances, cabinets, counter tops, etc. 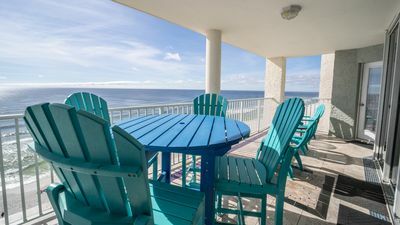 The long 715 square foot wrap around balcony offers plenty of seating and a several tables for outdoor dining as well as breath taking views. 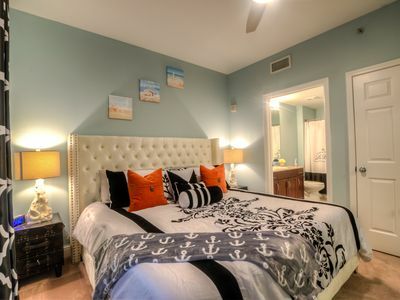 Fun, beachy decor gives a relaxing, happy atmosphere. 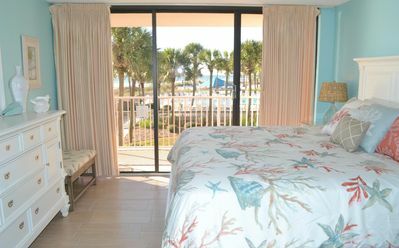 Master suite is oceanfront and boasts a king sized sealey I series pillow top bed, lots of closet space and flat screen cable TV. The Master Bath has new vanity, sink, faucet, and granite counter top as well as a gorgeous glass shower. The Second huge bedroom has two Queen sized beds with 4"foam toppers, plenty of closet space, and flat screen HD cable TV. The second bathroom has new vanity, sinks, faucets, and granite counter top as well as glass shower. The kitchen features LED lighting, new appliances, cabinets, and granite countertops. The kitchen is nicely equipped with new LG Refrigerator with filtered water and ice maker in the door, new pots, pans, utensils, etc. 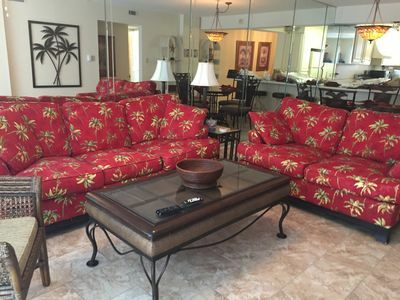 The Family Room has new leather sofa with queen sleeper, electric recliner (super comfortable), 60" flat screen HD Smart TV, and views, views, views! 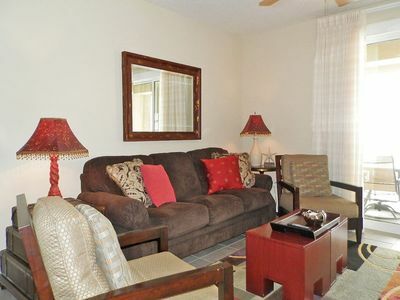 You will also enjoy the beach chair service with two padded lounge chairs and umbrella provided for this unit. 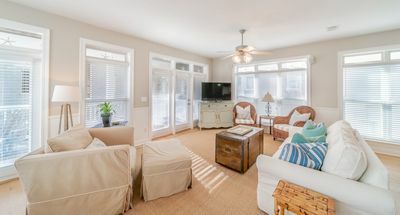 On Thomas Drive, this unit sits right on the beach on the quiet end of Panama City Beach. 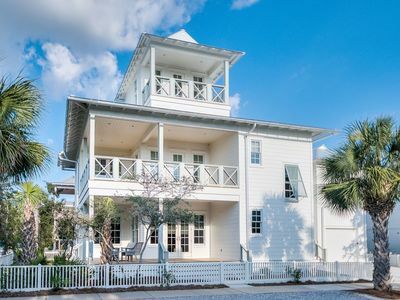 You are just minutes away from Pier Park, Captain Andersons, St. Andrews Park, Shell Island, Schooners, and many other local attractions. 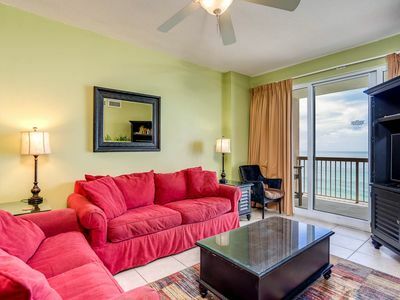 Our 17TH FLOOR end unit is BEACH FRONT located at the east end of the building and has breathtaking views of the beach, gulf, bay, jetties, and lagoon. 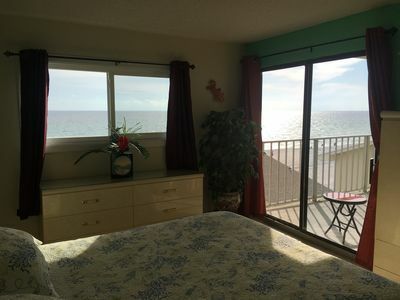 It also has a DIRECT GULF FRONT unobstructed view of the beach from the Kitchen, Family Room, and Master Bedroom. 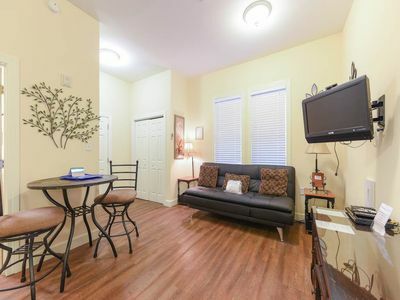 Free high speed internet is provided, tennis court, shuffle board court, indoor racquetball court, fitness room with a dry sauna, large pool, huge hot tub, and kids pool as well. Sunrise 0909 - Spring availability – won’t last long! 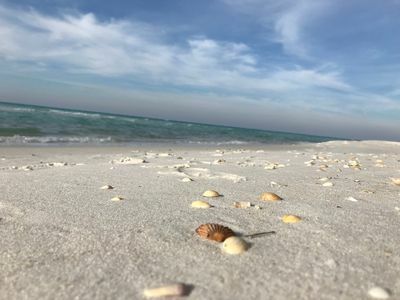 Village of South Walton H187 - Book your spring getaway! 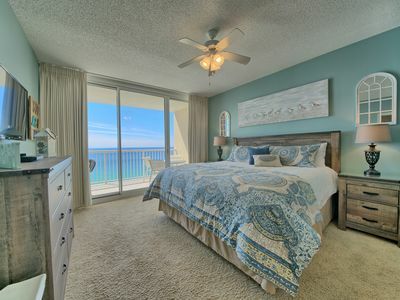 "BEST RATES ...RIGHT ON THE BEACH! 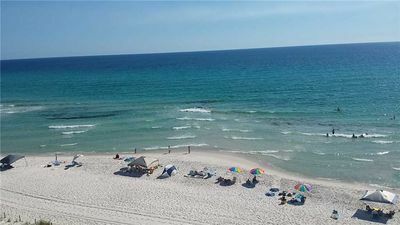 !,"
Beachfront Grand Panama ~ Private Balcony Overlooking Gulf of Mexico! 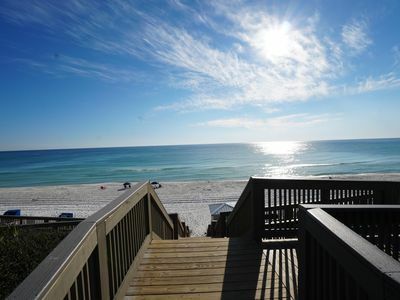 `15E High Pointe` Seacrest Beach Gulf Front Vacation Rental! Spectacular! 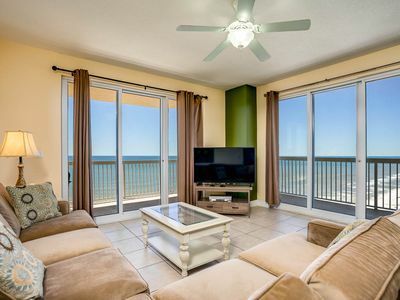 2BR/2BA • Gulf/Pool Facing 12th Floor Unit! 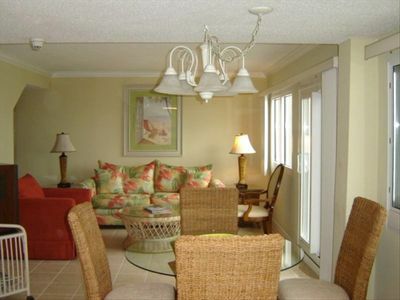 Pinnacle Port Vacation Rentals- B3 building, 1 bdr. 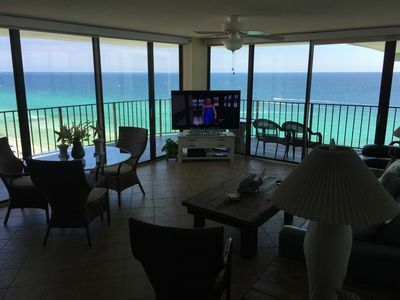 1 bth Gulf Front condo! C106 -Stunning sunset and pool views! 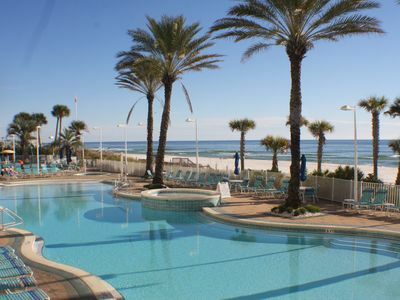 Resort with 5 pools, board walk, and more! April and May specials! BOOK NOW! July and August still available! 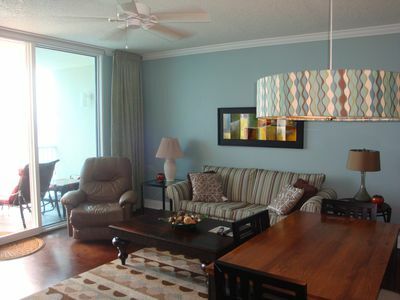 The Perfect Laketown Wharf Condo, Stylish and Accommodating! NEW! 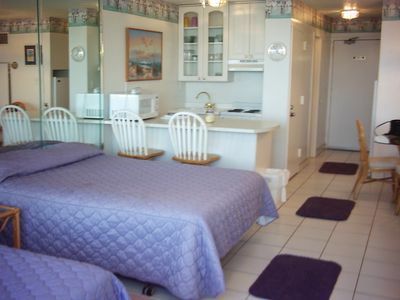 PCB Resort Condo Across the St. from Beach!